If you’re looking to create a pond or water feature that’s visually stunning, yet cost effective, then please view our range of pond pumps. Filters, pumps and water features play important roles in keeping your pond healthy and attractive. 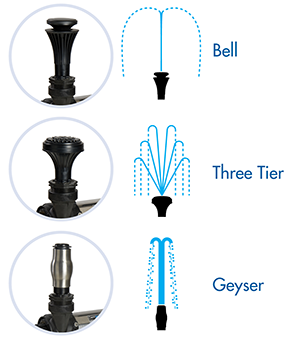 What is Different About a Pond Pump? Pond pumps have been specially designed to run continuously, and are able to pump debris, including plant matter, fish waste and general detritus. Pond pumps also use a non-toxic oil which is encapsulated in a chamber. On poorer quality submersible pumps, seals may fail over time, and toxic oil could pollute the pond. It is therefore paramount to ensure you purchase a pump intended for pond use. Inside the pump housing there is a motor and impeller. The motor will spin the impeller at high speed. The spinning impeller creates a pressure difference which draws water into the pump, and pushes it out the outlet. In our range of pond pumps, the impellers are a special kind of ‘non-clog’ impellers. This means the pump can run with a minimal amount of pre-filtration, with less danger of blockages. If you were to use a standard submersible pump in a pond, the pump may clog, causing it to overheat and fail. Why Install a Pond or Water Feature? Ever since ancient times, humans have used water for healing properties. We still use water for its calming properties, we holiday by the sea, and enjoy activities such as fishing, swimming and sailing. We visit spas and reinvigorate ourselves with soothing baths or showers. Adding a water feature into your garden can make the space more calming, as well as offering a lovely focal point. Whether you have a compact garden, or are landscaping a large site and installing a powerful fountain – we have the product for you. If you’re investing in a pond or water feature it is important to choose a reliable, hard-wearing pump. How Quickly Should the Water in the Pond Circulate? How quickly the water must be circulated depends on what type of pond it is. In a natural pond, a general rule is that all the water should be circulated every two hours. A Goldfish pondwill accumulate debris faster than the natural pond. They are generally smaller than natural ponds, with medium sized fish and some planting. In this case all the water should be circulated every 1.5 hours. In a Koi pond, there are high stocks of fish; debris and toxins will accumulate quickly. All the water must therefore be circulated in 1 hour. This type of pond requires filtering at the highest rate. Generally, the more fish or toxins produced, the faster the water must be circulated. If the water is not circulated, it can go stagnant. The level of toxins in the water will increase and the fish may be harmed or die due to oxygen starvation. It is therefore very important to make sure pond water is circulated. In comparison, a swimming pool only requires circulation every 8 hours. How to Choose the Correct Pond Pump? Choosing a water pump can be overwhelming, so we have created the following steps to simplify it. If you’re replacing an existing pump, we recommend looking at the technical specifications of that pump and matching it to one of the pumps in our range. Determine how quickly the water should circulate depending on what type of pond it is. Convert the Volume in m3to litres by multiplying by 1000. Divide this figure by the time (in minutes) in which the water needs to be circulated. You will now have the flow rate required in litres/minute. 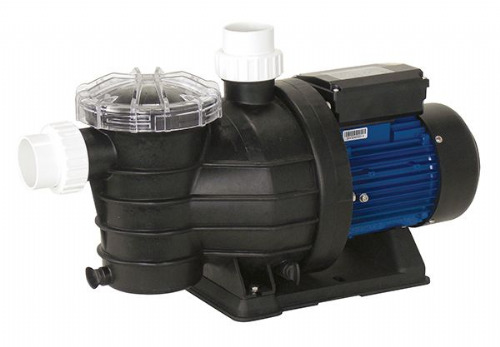 Choose a pond pump from our range. You may also wish to consider if a submersible, or surface (out of pond) pump is preferred. Surface pumps are generally only used for circulation and not for water features. 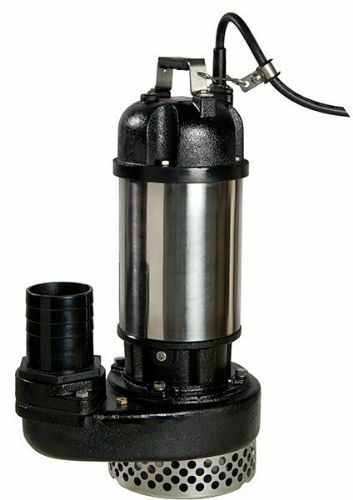 Submersible pumps tend to be cheaper to use and install as they do not require additional protective housing building. Also consider the aesthetics; submersible pumps are generally preferred as the pump is hidden in the water. In larger ponds, there is often more than one pump; one to circulate the water and pass it through a filter, and another for a water feature. You also need to check that the pump ‘head’ matches your system. The ‘head’ is the maximum height of a vertical column of water that the pump could support if there were no other losses in the system. It can be assumed that pumping water 10m horizontal results in a head loss of 1m. 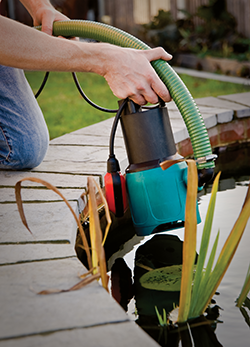 With pond pumps, avoid using transparent hoses as this can encourage algae growth within the hose due to UV rays. If you’re looking for a low maintenance pond this should be considered. We supply opaque hoses in our pipe section. Ensure you choose the correct size. Water features can also help ponds from producing algae. Oxygen has many benefits for the pond, and as a fountain passes water through the air, the water collects oxygen for the pond. If your pump has failed, it is vital to have a new one up and running quickly. Our pumps are therefore supplied with next day delivery. The SWIMM and SMP pumps are surface pumps which can be used for water circulation. 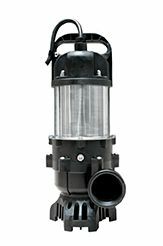 The TP, MH and HD-15 range are submersible pumps which vary in size depending on your requirements. 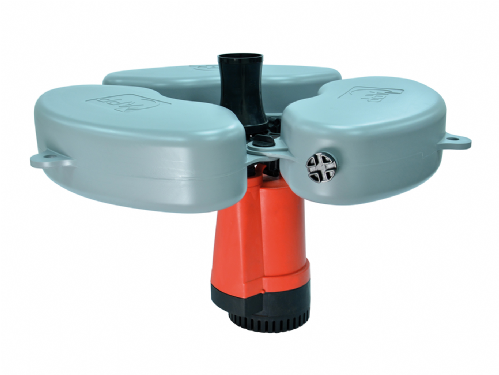 The TP range is our most popular style of pond pump. The HD-15 has a fantastic flow rate of 830l/min making it ideal for large ponds or impressive water features. If you require any more information or help on choosing the correct pond pump, please do not hesitate to contact us.